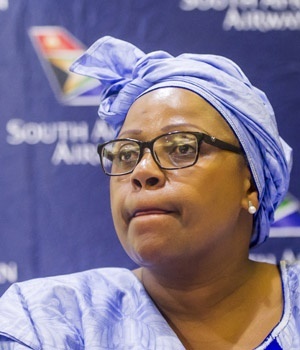 Cape Town - Transport Minister Blade Nzimande will not be appointing former SAA chairperson Dudu Myeni as a special advisor, as his predecessor Joe Maswanganyi intended. He said this in a written reply to a parliamentary question by DA MP Derrick America. Last year the Sunday Times reported that Myeni would be a special advisor to Maswanganyi which would see her close to R1m. At the time, Sunday Times reported that SAA would be moved to the Department of Transport and Maswanganyi said he needed an aviation expert. In Nzimande’s response, he said he had no intention to “retain” Myeni in his office. “The former Minister, Mr M J Maswanganyi, intended to appoint her as his Special Advisor reporting directly to him. “However, the appointment was never finalised as the department had to request further information in relation to her academic qualifications for purpose of verification; which information was never submitted until the former minister was removed,” he said. Nzimande explained that because Maswanganyi was removed Myeni’s appointment was not finalised as the terms of office would have been linked. Under Myeni’s tenure at the national carrier, it suffered losses amounting to R10.5bn, according to the Organisation Undoing Tax Abuse which then filed a court application at the North Gauteng High Court in March 2017 to have Myeni declared a delinquent director. The new SAA board has been working to turn around the airline. The new turnaround strategy sees SAA breaking even by 2021. The airline reported a loss of R5.67bn for the financial year ended March 2017. SAA CEO Vuyani Jarana told Fin24 on the sidelines of the International Air Transport Association (IATA) in Sydney this week that the airline was dealing with procurement and cost issues. The airline needs a total of R21.7bn to fund its existing debt and to fund the working capital to get to breakeven, Jarana told Fin24. “Either SAA must get a direct cash injection from our shareholder (government) or we have to find private sector partnering investment. We also have to bring the bank debt down and our plan deals with that, although it makes certain assumptions, for instance, about the oil price,” he said.